Order Saber Professional in the Online Store. Call us at 800-579-0580 for competitive pricing on larger quantities or for tech help. Advanced 2-cycle Pre-Mix products for all your home & commercial 2-stroke equipment as well as our unique outboard version. AMSOIL Saber Professional (ATP) and Saber Outboard (ATO) Synthetic 2-Cycle Oils are specifically designed for lean mix ratios in pre-mix applications. Saber Professional contains high temperature detergents for small power equipment. Hear our Audio Introduction on Saber Professional! Saber Outboard contains lower temperature dispersants for water-cooled outboard motors. Extensive testing shows superior lubricity and cleanliness properties at lean mix ratios of these premium synthetic formulations. It's a two cycle oil for any ratio! A single Quart treats up to 26 gallons of gas. Other than the AMO 10W40, The Saber 100:1 is AMSOIL's oldest product henceforth the one which has received the most attention over the years. Most of our heavy-duty lawn equipment accounts use it at 80:1 but even at 100:1 you can be sure that AMSOIL's guarantee against failure is quite solid. Comparing ours at 100:1 to their's (40:1 or other ratio) ours will still offer lower temperature, better fuel efficiency, easier starting after storage and longer life. One ratio - all equipment. Your investment will be protected. Why? Because the additives protect the exhaust side of the piston and rings better. Less carbon build-up and less metal to metal contact. Trust AMSOIL Saber in your most precious gear and save $ on repairs, downtime and replacement costs. AMSOIL lowers cost of ownership! Buy in the Online Store Call us to learn how to make the most out of a small order with the set shipping rates. I can email you a rate schedule and suggest related products to maximize your Amsoil Experience. Specifically designed for outboard motors, Saber Outboard (ATO) contains a heavy dose of low-temperature dispersant additives that excel at reducing varnish and carbon deposit formation in water-cooled motors. 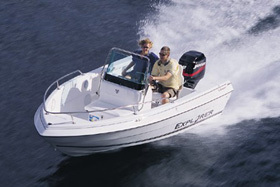 Saber Outboard also performs well in personal watercraft, jet boats, motorcycles, snowmobiles and ATVs. Its low-smoke, low-odor, low-toxicity properties produce fewer emissions at 100:1 mix ratios than oils mixed at 50:1, benefiting operators and the environment. Saber Outboard is formulated to prevent “oil loading” and plug fouling for rapid throttle response, making it ideal for trolling motors. Recommended for pre-mix use where TC-W3 or API TC is specified. When you use a higher quality oil you simply need less. AMSOIL Saber has a higher film strength of several thousand times which doesn't allow metal to metal contact thus effectively reducing temperatures. They save time and prevent problems caused by having several different mix ratios. See our actual cost per gallon chart to see just how economical AMSOIL 100:1 Saber Professional is. AMSOIL 100:1 works in all equipment. The higher film strength of about 4000 times virtually eliminates metal to metal contact. Lower temperatures, zero carbon buildup, high detergent levels, low odor and emissions makes this a no brainer. A note on solvents - The main function of solvent in 2-cycle oils is for fluidity and miscibility. It is added to lower the cold temperature physical properties of an oil. It helps the oil mix better with the fuel and it thins the oil out so the injection system can pump the oil. It can provide some small amount of cleaning performance. It does not produce a lot of smoke. Typical 2-cycle pre-mix and injector oils can contain as much as 30% solvent. Therefore by reducing the amount of solvent, you are increasing the quality of oil which actually performs the necessary functions of a lubricant. Keep in mind however, proper formulation of the oil is key to achieving the desired performance. This helps explain how AMSOIL ATP can perform at lean mix ratios such as 100:1. It contains extremely low levels of solvent and therefore adds up to 25% more actual lubricating oil to the system. Also need a 4-Stroke oil for your hard working high heat small engines? We now have something specific to your needs. AMSOIL SAE30/10W30 Commercial Grade Synthetic. When I first purchased AMS Oil’s two-cycle fuel mix, I was reluctant to run my chain saw at the prescribed 100:1 ratio. However, after reading the technical literature that your company supplied me, I then decided to try the recommended ratio. As a result, almost immediately my chain saw ran smoother with no resulting damage to either the engine or carburetor. 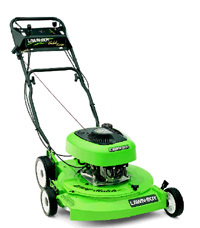 What is more, after I added AMS Oil’s P.I Performance Improver Additive to both my chain saw and weed wacker, years of deposits that had formed in both engines, were burned off in minutes. Even the gas tanks regained their like-new appearance. Thank you for providing me with great products that enables my equipment to last longer and run more efficiently in the harsh climate of northern Maine. Because of your knowledge, expertise, and honesty, concerning synthetic oil applications, you now have a loyal customer for life. Since this letter AMSOIL has come out with a more cost effective gasoline additive for small engines which was just recently voted by SEMA officials as the powersports product of 2010. That product is AMSOIL Quickshot SE. E15 fuel has been approved for sale. Be Prepared! As I write this month’s Tech Talk, the U.S. nationwide average price for a gallon of gasoline is $3.85. On May 8, the Energy Information Administration (EIA) released a revised forecast for gas prices during the summer driving season (April through September) that predicts the average price will drop to $3.79. That’s good news for all of us, whether filling up for the daily commute or planning a longer road trip. Regardless of what vehicle you drive, it’s likely that maximizing fuel economy and extending engine life are high priorities. In fact, a 2011 survey by the Consumer Reports National Research Center found the “age of the average car driven by respondents has increased to eight years,” with 23 percent of motorists surveyed driving cars from the 1990s. And for those planning on purchasing a new or newer model, 62 percent expected their next vehicles to have better fuel economy than their previous models. In April 2012, the Environmental Protection Agency (EPA) approved the sale of E15 (15 percent ethanol and 85 percent gasoline) for cars and trucks manufactured in 2001 or later. This extended by six years a 2010 waiver permitting the use of motor gasoline blends containing up to 15 percent ethanol in 2007 and newer vehicles. All other gas-powered engines, such as those on boats, snowmobiles, lawn mowers, motorcycles and off-road vehicles, are prohibited from using E15. This means that the current E10 (10 percent ethanol/90 percent gasoline) blended fuel, sold at more than 90 percent of service stations nationwide, remains the de facto choice for owners of model year 2000 and older vehicles and other gas-powered engines. The exception to this being flex-fuel vehicles compatible with E85 (85 percent ethanol/ 15 percent gasoline). Automakers have resisted the new E15 ruling, arguing that their vehicles – new and old – aren’t designed to accommodate gasoline containing 15 percent ethanol. Service station owners have concerns about potential liability issues arising from consumers using the wrong ethanol blend and are worried about the costs of retrofitting gas pumps or installing new ones to make E15 available. While the future of E15 is uncertain, ethanol-blended fuels are here to stay. Ethanol has been used for decades as a gasoline additive because it burns cleaner than gasoline. The downside to ethanol is its fuel economy and performance. Ethanol produces less energy than gasoline. According to the EIA, “A gallon of ethanol has only two-thirds the energy of a gallon of conventional gasoline, and the number of miles traveled by a given vehicle per gallon of fuel is directly proportional to the energy contained in the fuel.” In addition, studies have shown fuel systems containing plastic or rubber components can be damaged by ethanol exposure. There are also problems at the molecular level. Ethanol and gasoline do not form chemical bonds and ethanol is highly attracted to water. Even small amounts of water entering the fuel supply can break the weak ethanol-to-water bond and separate (phase separation). This suspension falls to the bottom of the fuel tank and can increase engine temperatures and cause engine damage. Less energy per gallon and phase separation are just two of the problems inherent with ethanol-blended gasoline. Smaller engines face additional maintenance and performance issues. Quickshot® is designed to keep water dispersed and helps combat problems associated with ethanol-blended fuel. It also cleans deposit build-up in fuel systems and combustion chamber components. This means better performance and reduced impact from ethanol-blended fuels. We all value our free time; engines need to start on command when we get a sliver of time to get out and go.